I can board your guinea pig for holidays. Just bring your guinea pig along and I will supply all the food and bedding. I have lovely clean, and varnished 4ft hutches that are cleaned out once a week, and your pig will be put out in a run on the grass as often as the weather permits (in the Summer months). All hutches are disinfected with F10 or V18 disinfectant spray. 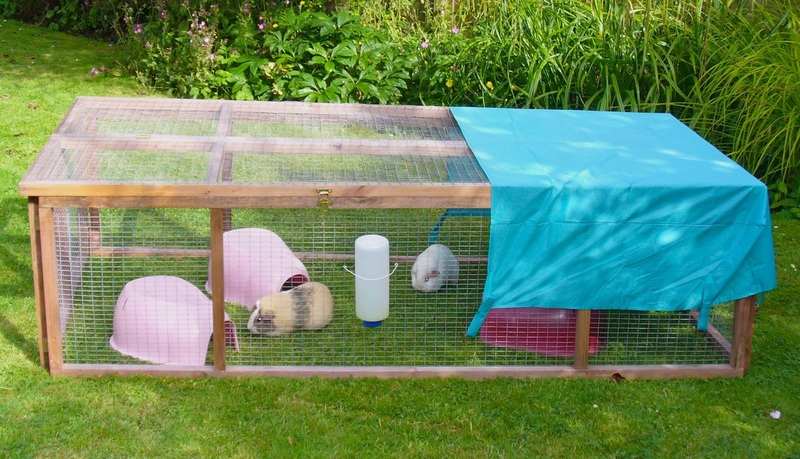 All guinea pigs are kept in the garage, ​I cannot board any guinea pigs indoors! I feed the pigs greens/vegetables/fruit once a day (in the morning) along with a guinea pig pellet (Charnwoods Guinea Pig Pellets), and then dried grass in the afternoon (Just Grass from Dodson & Horrell). They are given hay in their bedroom compartments in the evening. If your guinea pig is used to having bran, they can have this as well. Prices are charged by the day and not per night, regardless of collection time. Please note that I no longer accept pets to be dropped off or picked up on the public bank holidays. Drop-off and picking up times are by appointment only and should be arranged between 10.00am and 7.00pm. Sundays I am only open between 10.00am and 1.00pm. Also on some Sundays I may be leaving early for a guinea pig show, please check with me when booking. Other small pets (hamsters, gerbils, mice etc) can be boarded, please contact me for details. Sorry but I do not board rabbits. If you would like to come and inspect the hutches in advance, please contact me to arrange a time to visit. Please e-mail me if you would like any more information. Or telephone: 01737 814371. Bathing and Grooming - why not let me give your guinea pig a pampering session while they stay with me! I will clip toe nails of pigs that are not boarders, so give me a call if you want this done. But I am no longer bathing pigs that are not staying with me. Give me a call if you would like advice on how to bathe your pig yourself! I use Johnsons Insecticidal Shampoo and also Anigene Antifungal Shampoo (formerly Sporal D). "Our pigs have had many lovely holidays with Sue, they are well looked after in spotless hutches, with their favourite food, and the occasional nail clip, we don't hesitate to send them whenever we are away!" "We have boarded our two sows with Sue for many years now, she provides a very friendly welcome at drop off. It's nice to see her own piggies, in the same environment as the holiday boarders, and you can see she clearly adores them all. She is very good at fitting in with holiday plans. The hutches/cages are well cared for and very clean. Lots of food, dried and fresh, available and Sue is great with fussy piggies! Exercise available subject to weather. When one of our sows got poorly Sue was fantastic in getting her the right vet care with a minimum of fuss. She has always been on hand with advice when needed." "My guinea pigs have been spending their holidays with Sue for ten years. You can be sure of a warm welcome and the peace of mind that your pets are cared for so well. 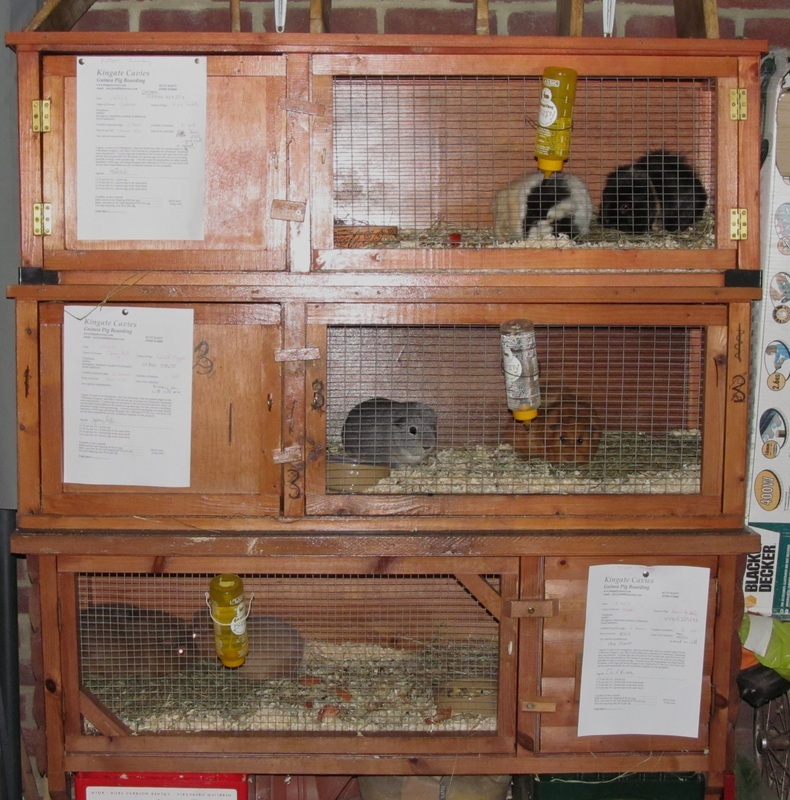 Sue is an experienced guinea pig breeder and has great expertise in their welfare. The cages are spacious and the animals are given plenty of fresh food and hay. In the summer they have the opportunity to enjoy the grass in the garden. I can wholeheartedly recommend sending your guinea pigs to Sue for their holidays!" "I bought our Guinea Pigs from Sue two years ago and they have been boarding with her when we are away ever since. Sue is very knowledgeable and experienced and always looks after them beautifully. They are well cared for, comfortable and happy. Sue's premises are clean and well organised and I have always found her to be friendly and professional. She also clips their nails and gives them a bath upon request so they return home well and truly pampered! Leaving the guinea pigs with Sue gives me complete peace of mind whilst I am away and I wouldn't consider sending them anywhere else. 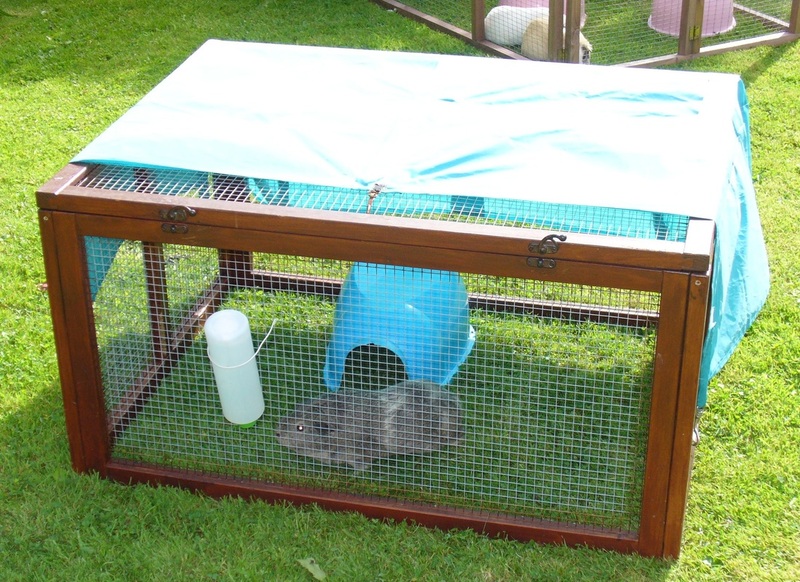 I have absolutely no hesitation in recommending her and her guinea pig boarding service."